The Busse Obstetric Kit is a complete disposable obstetric kit made available in either a cardboard box or soft pouch packaging. 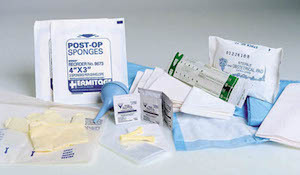 Each kit contains essential equipment to provide for hygienic delivery conditions. Each kit costs approximately $12 USD if purchased individually. Contact the solution provider for information on bulk pricing.